Today we’d like to suggest you an itinerary in the eastern edge of the Alpine arch, namely in the Julian Alps, quite south, not far away from the Adriatic sea: an itinerary to the top of the Krn range (in Italy called “Monte Nero”, Black Mountain, due to a misunderstanding of the Slovenian name). As Italy entered the conflict, the Austrian-Hungarian Army withdrew from the old border on the left bank of the Isonzo, since it was easier to defend, and took position on a front line that run from the Rombon Mountain, across the Carso to the sea. 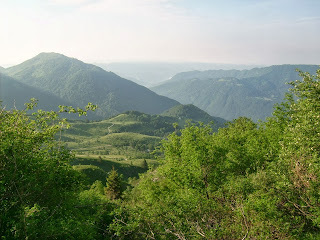 Only few miles to the east of Caporetto, the massif of Krn that thrusts ridges in all directions and reaches the 2.245 m. was one of the highest peaks in the valley. We are therefore in the region of the battles of Isonzo River, fought between June 1915 and October-November 1917, one of the fiercest chapter of the Great War on this front. Already during the first month of the conflict the Italian Alpini conquered the summit of Krn, fortified it with trenches and caves and kept control over it till 1917 and the 12th Isonzo Battle, when they were forced to beat a retreat with the Caporetto rout. This mountains bears witness of the destructive power with which WWI affected not only human history, but also the nature: galleries, fortifications but also big mine craters created by mines explosions upset the landscape here. An excursion on the Krn Mountain discloses therefore a tragic, yet important page of the history of the Great War in the Alps. The today itinerary climbs the southern slope of the Krn. It does not present any particular difficulty and is a little bit shorter than the others ascending path (for example the other classical itinerary, on the northern side, starting from Lapena Valley), but can be done only with optimal weather conditions. If you are trained and in good physical shape, the ascent takes about 3h00. You need the normal mountain equipment and in addition a helmet, a lamp and – don’t forget! - drinking water which is hard to find during the ascent. You should start hiking quite early in the morning, since the path is sun-drenched; otherwise you may take some additional water. Put eventually in your backpack also some food, especially if you’re not going to undertake the itinerary in the summer (the refuge on the top may be closed). Starting point is about 1km outside the little village of Krn, where you can find a small car park. If you look up, at the top of the mountain you can nearly recognize the refuge. Start walking along the track departing from the park. After about 1 Km, on the right a path marked on the rocks climbs up through “malghe” and pastures and reaches the old mule track; follow it. When you are nearly half of the way, you we’ll cross the path ascending from Dreznica (steeper and less frequented). The trail climbs up then with many hairpin turns till the refuge Gomisckovo Zavetisce which is placed only 5 minutes under the top. If it is open, you can have a rest here and eat something. Otherwise we suggest you to reach immediately the top and take a break there. An unforgettable panorama is offered to you: the Julian Alps (with the Canin Mangart Tricorno ranges) and, far beyond, the Dolomiti, at your side, and then the Austrian peaks on the north-horizon, and then turning again, the Slovenian and Croatian border, and south the coast of Istria, the gulf of Trieste and the Adriatic sea. If this was regarded as a “forgotten front” for a long time in the historiography, you will probably understand how this interpretation was a reductive mistake: just try to connect these places with their cultures and their historical heritages, from the Romanic and the Slavic till the Austo-Hungarian and the Italian ones, try then to think about the melting pot which embodied these regions and - as a consequence - the intestine conflicts blew up with the WWI. The nearest point at which you have to glance lies few meters away: the peak of Mountain Botagnica (also called in Italian “Monte Rosso”, Red Mountain), that you can eventually reach. You have in fact three possibilities to return back to the car. 1) You can walk down the ascending path. 2) You can walk along the marked path from the top of the Krn to the near pass between the Black and the Red Mountain, the Krnska Srbina, where you can find relicts, among others one of an old cannon. From here you walk down along a trail which leads you back near the crossing point with the path ascending from Dreznica on the previous mule track that runs to the parking area. 3) Otherwise, from the Krnska Srbina you can climb to the top of the Botagnica (about 100m of altitude gap). The path follows an old war passage with rocky ladders, it is therefore quite narrow and exposed but it is worth, since on the top you find a small plain with many remnants of the Great War. Following the marked path (on the rocks or with other signs) you walk above a small lake (you may also cross some innocuous snowfields) then reach another small pass where the descending path starts and runs to a “malga” (a small hut with pasture) and then in 15 minutes to the parking place. This last alternative is of great emotional impact, however please note that it is much longer than the other two (it takes about 3 hours to walk from the Krn summit, through the Botagnica summit, back to the parking area). This detail is very important because you have to give up in case of rain or unstable weather (and we know how unstable the weather is especially in mountain): walking on the Botagnica with bad weather conditions is very dangerous due to continuous lightning discharges. So, be careful, and choose the safest alternative in order to enjoy fully your hike.